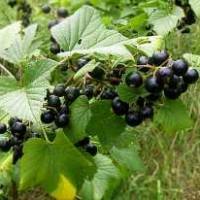 A simple and easy blackcurrant wine recipe that produces a medium-sweet, rich, complexly flavoured red wine. It’s similar in some ways to a Beaujolais but with a little more depth. Pour over 1 gallon of boiling water. Once cooled a little, add 1 Campden tablet, crushed and dissolved in a little warm water. Cover and leave for 3 days, stirring with a spoon sterilised with boiling water. It’s important not to allow fermentation to start with wild yeasts before we want it to. Strain into a large pan (a preserving pan is ideal) through a fine sieve, heat a little and dissolve the sugar into the liquid. Add the yeast and yeast nutrient. Pour into a fermenting bottle with air-lock and leave until fermentation has finished. Rack, as necessary, adding a Campden tablet after the first racking. This blackcurrant wine recipe makes about a gallon of medium-sweet, red wine. It can be drinkable after just six months but do give it at least a year to mature although two years would be even better. There are a number of variations on blackcurrant wine but this simple recipe forms the base. Like many of the simple things in life, it is very good. Made this last year and was awesome. Picking the currants as I type and have already prepped the Demi’s. Try it with redcurrants too, device. Cheers! Did I write ‘device’, I meant devine. That’s how good this is! The idea of the tablet is to stop wild yeasts fermenting the must but you can get away without it sometimes. I think I’d put the tablet in now and give it a day before carrying on as per the recipe. Thank you for your reply. I have to admit that I didnt want to throw good onto bad. If you think it should be ok I will give it a go. Thank you. I’ve brewed this recipe before with no campden tablet – I clean forgot. It was a little volatile for a day or so after I added the yeast, forcing must froth through the airlock but soon calmed down. It brewed out ok and made a very passable tipple. Sit the demijohn in a clean fermenting bin, it will stop the walls getting redecorated! And have a couple of spare clean airlocks to swap over. Remember cleanliness and hygiene. If I want a drier wine, how much less sugar should I use? I’d give it a couple of days to see if it restarted naturally. Failing that, mix some yeast into a little boiled (and cooled) sugar water, let that start to bubble and then add it to the demijohn. Hi John I left the black currant wine for a few days added the yeast and sugar mix to no avail. Hi Arthur – well I’m out of ideas. It’s usually pretty straightforward. Perhaps someone else will comment with a suggestion for you. If your yeast fails to start, try again but use yeast nutrient as well. Currants do not have the proper chemistry to interact with the yeast without something for it to feed on before producing it’s own to continue. Hi, I am attempting Cassis made by fermentation rather than adding bcurrants to alcohol. I couldn’t find any recipes apart from one that was for a similar alcohol. It told me to simply add sugar and water and use the natural yeasts. It has been sitting in a demijohn with airlock for 16 days in this warm weather and is still fermenting like crazy. My inclination is to move it to a dark, cooler space and leave it for a couple of months as it says to do in the recipe. My question is – why is it not recommended to use wild yeasts and does anyone have a more solid recipe for cassis made this way or has tried it?